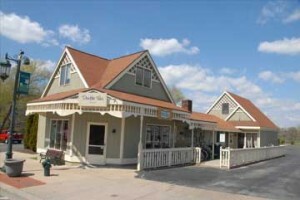 Double Take is the current resident of the original train depot building, built when the village was named Laphamville. 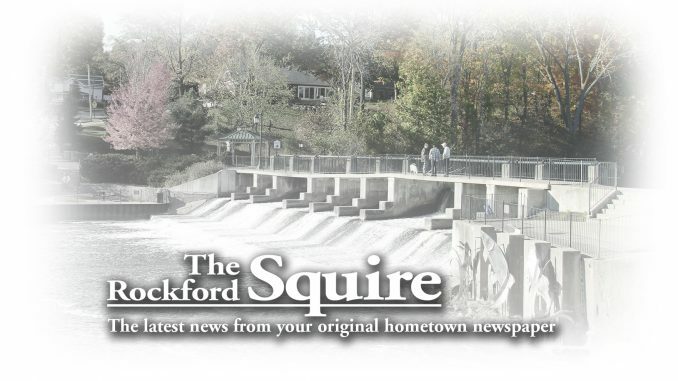 Motorists heading north from Rockford on Edgerton Avenue and travelers on the White Pine Trail between Rockford and Cedar Springs will be familiar with the historic Trestle Bridge. The bridge was built as part of the railroad line of the Grand Rapids Indiana Railroad Company in 1885 as a crossing over Stegman Creek. Homer Burch’s grandfather was a workman on the project. Another remnant of the railroad line is the original depot, which is still in existence in downtown Rockford. Most recently housing the second-hand store Double Take, the center section of that building was the train depot. It was since added on to the north and south to form the existing building. A significant tidbit of history for the town is related to that building. Known when the depot was built as Laphamville, the train officials asked the village to come up with a shorter name, as Laphamville (after founder Smith Lapham) was too long to go on the depot sign. Village fathers came up with Rockford because of the Rogue River fording place, which was a shallow, rocky place to ford the river. This was in June of 1866. A historic Grand Rapids book shows the Grand Rapids Union Station for the Grand Rapids/Indiana Railroad in 1910. 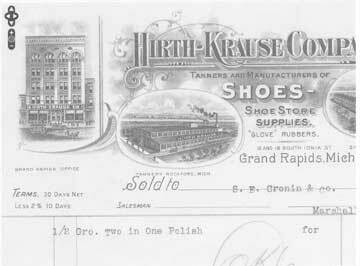 The Hirth-Krause leather company sold leather supplies at their Grand Rapids store in the late 1800s. All around the same time in the late 1800s, the Hirth-Krause Company in Grand Rapids had their “tannery row” at 16 to 18 Ionia Street. The Hirth-Krause leather company sold leather supplies (see image of the catalogue). G.A. Hirth and his uncle, Frederick Hirth, founded the business in 1883. The Frederick Hirth House can still be seen at 230 College Street in Grand Rapids and the G.A. Krause house can be viewed at 401 Crescent Street in Grand Rapids. G.A. and wife Henrietta came to Rockford in 1924, and when G.A. died in 1941 his daughter Henrietta VanWiltenberg moved into the family home. The shoe factory in Rockford had opened in 1902 and 1903. About this time nationally Teddy Roosevelt was president and there was no vice president. The Wright brothers were experimenting with the first powered flight at Kitty Hawk. Two rock carvings found in Rockford and signed “H.E.B.” could possibly have been the work of Harold E. Bailey, Jr. But this mystery will most likely never be solved. DeMaagd’s final topic is a serious mystery to which no answer is ever likely to be discovered. 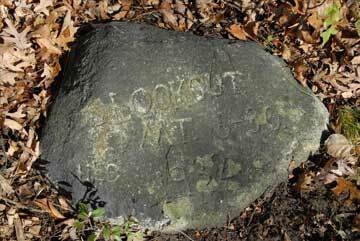 Still in existence in Rockford on private property are two rock carvings, the work signed by the initials H.E.B. One carving is “Lookout Mt.” with the year 1932 and H.E. B. The other is “Prof. Einstein” also carved by H.E.B. in 1932. “Lookout Mountain is in Tennessee,” noted DeMaagd. It is a tourist destination with views of the Chattanooga Valley. Einstein, in 1921 won the Nobel Prize in physics and visited New York City for the first time in 1921. He was noted as a pacifist in the 1930s and immigrated to the United States in 1933 (after the date on the rock). He worked at the Institute for Advanced Study at Princeton University until his death in 1955. 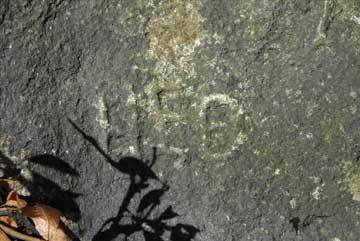 DeMaagd said the date of the carvings of the rocks would have been during the height of the Great Depression, and a young man of the time might very well have been unable to find work, leaving him with time on his hands. The Rockford Historical Society meets the first Thursday of each month at the Rockford Community Cabin, 220 N. Monroe Street downtown Rockford. Their meetings are free, open to the public and include refreshments.